From time to time we all have issues that we just don’t know how to solve. As an example my son wanted to use Tekkit with Minecraft and he asked me to install it for him. It took a while to get Tekkit working on his laptop and each step of the way I used various resources to solve the problems that came my way. The problems I experienced included the fact that his laptop needed a different java runtime version installed, then the launcher would not load because despite having java installed the Tekkit launcher could not find it and then when it did load it became stuck at the splash screen because Zonealarm was blocking access to the Tekkit servers and even when Tekkit loaded the connection to Minecraft would not work because Zonealarm blocked access to the Minecraft site as well. If you are trying to install Tekkit/Minecraft read this http://www.everydaylinuxuser.com/2012/09/how-to-resolve-tekkit-launcher-freeze.html. The point of this article is to highlight the best ways to get support for not just Linux problems but all sorts of other PC issues. As a software developer this is the most important resource on Earth. If Google decided to charge for searching I would go bankrupt. (or use DuckDuckGo). Personally I’d rather go bankrupt than try Bing. Googling is a skill and as much as Google tries to think for you, sometimes you don’t get the results you were hoping for. For me there is one rule about Googling and that is if you don’t find the answer to your question then either there isn’t an answer or more than likely you are asking the wrong question. Simply the best way to use Google though is to type the subject area and then the issue you are getting. 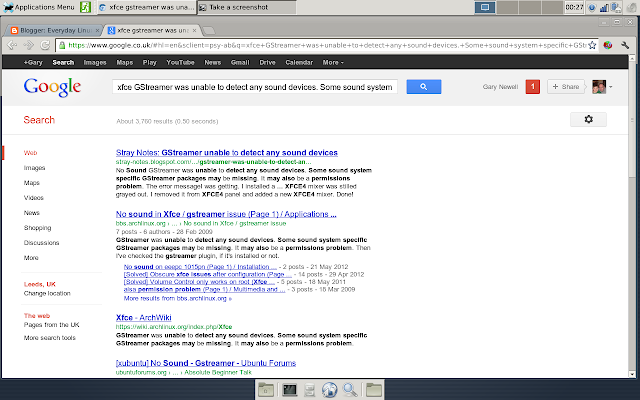 Now when I am searching Google for an answer I will type “XFCE ” and then paste in the error message. Instantly I am given access to a list of results which I know will provide me the answer to my issue. Google is first on my list because it really is the first place to look. The only criticism of Google is that there is as much misleading information as there is good information. (for instance one of the links within my search for Tekkit help genuinely suggested that I turn off the firewall software whilst running Tekkit). Google will probably lead you in this direction anyway but you should be aware of the forum that you need to visit for answering queries. Now there are really some rules you should follow when using the forums. Search the forum – It is highly likely that the question you are about to ask has been asked before. Searching the forum is not only polite because it saves the forum administrators constantly redirecting users to the post that answers the question but it means you get the answer to your problem sooner. Find the right section of the forum to post your question – Posting your question in the wrong section of the forum will delay the response and it will again mean a moderator has to move the question to the correct forum. Only ask your question in one section of the forum – Asking your question in multiple places within the same forum will just annoy the moderators and it will not get you an answer any quicker. Be patient – People who post answers on forums are usually doing it for nothing. If you post a question and then refresh your browser 2 minutes later, find no answers and then buzz to see why nobody answered is considered bad form. Forums are a great resource but unless your question has been asked before it can be some time before your question is answered. If you are looking for a more immediate answer then read on. If it doesn’t come pre-installed on your system install XChat. XChat is an IRC chat client and provides you access to chatrooms for all the major Linux distributions and most of the minor ones as well. If you are using a more popular version of Linux you are more likely to find a chat room with more members and so you are more likely to get an answer to your issue straight away. If you are using a smaller, less popular distribution and you find the chat room barely populated then consider the base system on which your distribution is derived and then visit that chat room as it is likely that you will get the answer to your question there. IRC chat rooms are real time and the likelihood of getting help is very good. Every IRC chat room I have been to for support has been brilliant. There is always one person willing to bend over backwards to help you resolve an issue. As with forums it is good form to be polite and be patient. The contributers to the chat room are probably not being paid to help you. You Tube is not just there for watching parodies of Internet Explorer adverts (http://www.youtube.com/watch?v=r8dtlEeLaBM) or Hitler hating Microsoft (http://www.youtube.com/watch?v=q59_h_dJdnU). You Tube has thousands of videos on nearly every subject that demonstrates how to solve issues. As a software developer I have used this to learn new techniques. You Tube provides the best free training you can get. Imagine you wanted to install Compiz within Peppermint Linux. Just watch this video (http://www.youtube.com/watch?v=LkXRdv7BNDo). You Tube is great for watching how to resolve a problem visually. I would generally recommend visiting the forums first and the chat rooms on IRC first because you are more likely to find a dedicated Linux person to answer your Linux queries using these methods. If you are really stuck and the previous 4 options have been exhausted give Yahoo Answers a try. Post your question and wait for the replies to appear. The thing I have found is that the answers are a mix of flippant remarks (For example “I have an issue with Ubuntu that….” would be answered with “Use Windows” or “Use Slackware”. Not helpful), misleading answers (One guy recently asked a programming question and all 4 answers provided up to that point were simply wrong) or correct answers. As it is so hit and miss this is my least favourite place to find an answer to a question but I do answer questions on the site. Linux is very well supported and help is easily accessible. Feel free to add comments with other methods for getting support for Linux. I would generally not recommend anyone to try on Yahoo answers due to the same reasons mentioned by you. 🙂 Generally 99.99% of all your problems should get solved by the first four resources and I'm sure that the remaining 0.01% won't be get solved by Yahoo answers!! Apart from that, yeah it is a nice article!! Same thing as Sibi Prabakaran said, the first four is bound to give you the solution, If that doesn't work you will have a hard time to fix it. I would recommend Google+ as the five one though, that place is like a geek dorm where they will help you out. Just need to tag in one or two of the Linux group for faster support. Interesting that the result you got in using Google was for the Arch Linux forums… I have found that these are by far the best forums out of any distribution-specific forums, especially for more technically inclined users. Answers are often provided with the reasoning behind them, not just a one sentence answer "run command x" or "install y" as on some other forums. Also a lot of the answers on there can help on any distribution, not just on Arch. The funny part is, those are pretty much the same as the best sources of support for Windows once you change "Linux support forums" to "Windows support forums." Microsoft phone support doesn't add anything significant to the equation without going to their paid support (which is of course an option for certain Linux distributions as well). With Windows you can always use Knowhow at PC World. (I crack myself up sometimes :)). You are right. There is no more support for Windows than there is for Linux. It used to be the case that everyone knew a guy who could help them fix their Windows PC. Well nowadays I bet it is just as easy to find a guy that can fix their Linux PC. The Crunchbang forums are the absolute best forums on the web. While it is dedicated to #!, the members there are very friendly and will help you no matter what distro you use. I was looking for some good Linux resources apart from the chain of stack overflow. And here found a bunch of good options, they are so practical indeed. Thanks for posting such a real stuff.